The customer must pay the Balance for Financing mentioned in the table above under Column 1(D) through a financing agreement with any of the Participating banks above.The payment must be through monthly installments based on the computation agreed upon between the customer and the Participating Bank. NPI reserves the right to include additional Participating Banking institutions to the above-list. The entitled customer will only be required to pay the 20% down payment net of the savings, as indicated in the table under Column 1(C). To avail of the low down payment promotion, the customer’s application will be subject to the approval of the Participating Bank. NPI does not guarantee that the purchase of any of the variants listed above will automatically merit approval of any Financing or Automotive Loan from the Participating Bank. The low down payment promo includes free LTO registration for three (3) years, one year comprehensive insurance, and chattel mortgage fee. b. Cash discounts will be deducted from the full Suggested Retail Price amount of the vehicle. c. Customers paying in cash shall pay for the full net amount of the vehicle after deduction of cash discount through cash or check payment directly to the participating Authorized Nissan Dealer. d. Customers who secure financing through non-participating banks must ensure that the bank payment is made directly to the Authorized Nissan Dealer. e. The payment forthe Purchase Price of the participating vehicle, net of the Cash Discount must be completed within the Promo Period. 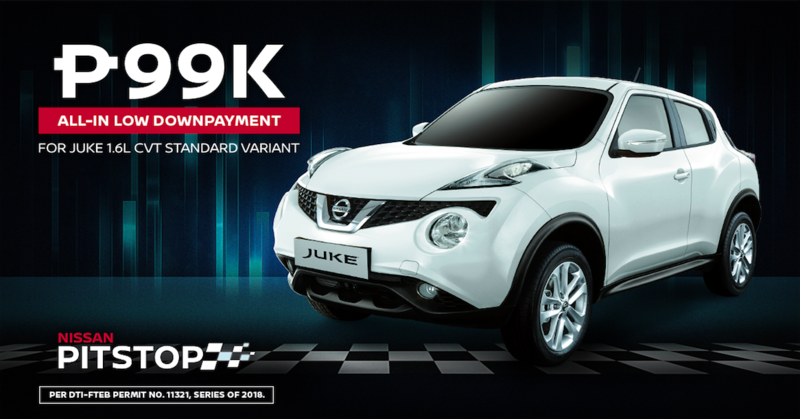 The participating variant must be purchased by the customers within the Promo Period, i.e., July 1 to 31, 2018, as evidenced by the date on the Sales Invoice issued by the Dealers. The purchased participating variant must be delivered to, and accepted by, the purchasing customer no later than five (5) working days (including Saturdays) of the month immediately following the month when the vehicle was invoiced to the Customer. The list of purchases must be submitted by the authorized Nissan Dealer to NPI on or before 5PM of the first working day after the last day of the PITSTOP Promotion. Any purchase of participating variants outside of the special dates for the conduct of the PIT STOP Promotion are still be eligible to avail of the low down payment promos or cash discount but without the additional Pit Stop Offer for Reservations and Test Drive [See Section C (a)]. Nissan reserves the right to announce the dates of the conduct of the Special PIT STOP promotion at least one-week before the scheduled dates of the Special PIT STOP Promotion. Per DTI-FTEB Permit No. 11321 Series of 2018.